Now that winter is here, our Garfish chefs have plans to spoil you with a range of hearty, warming and comforting dishes to take the bite out of the cooler weather. Some highlights of the season include seared scallops with a winter twist and a selection of fragrant fish curries back by popular demand. Manly’s woodfire oven is well suited to the cooler weather, and we’re offering delicious wood-roasted octopus for entrée and a main of hot smoked rainbow trout. Our winter desserts aren’t to be missed either. If you’re in the mood to indulge, Manly’s much loved dark chocolate fondant is back. If you’re after a sweet finish to your meal, Crows Nest’s steamed cardamom and lemon curd pudding is worth coming out for. And of course, Kirribilli’s sticky date pudding is the ultimate comfort food. For fish lovers with meat loving friends and family, don’t despair. Each of our three Garfish restaurants have a mouth-watering meat dish on the menu guaranteed to satisfy. The team at Garfish look forward to taking the chill out your winter with our range of warming winter dishes. Octopus is currently in season and Manly’s wood roasting oven gives the octopus a delicious smoky flavour. Paired with chorizo sausage, semi dried tomatoes and black olives to add a tasty kick, the herb salad balances the flavours out with its subtle chilli vinaigrette. Our Executive Chef considers this entrée a stand out of the season, so it’s not to be missed. 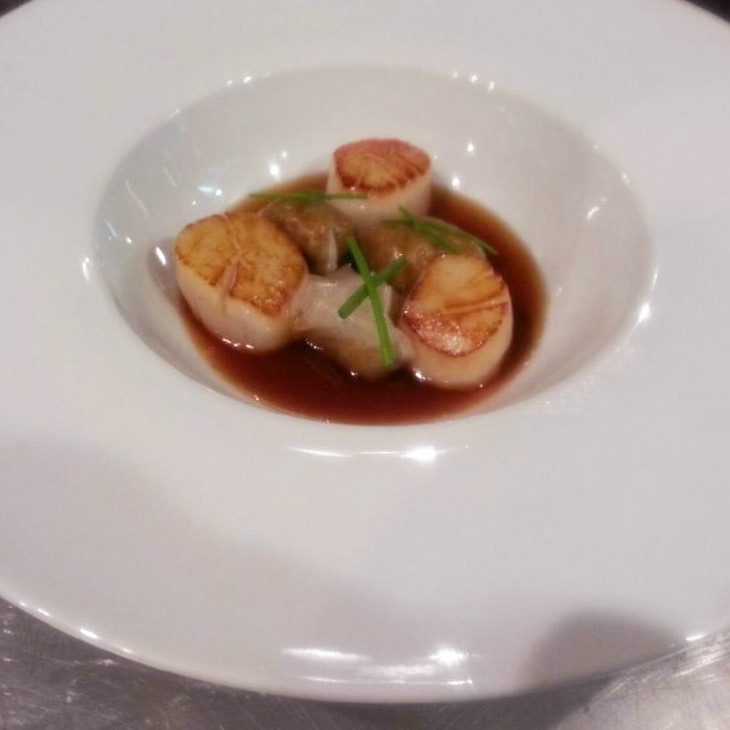 Scallop lovers are in for a winter treat, with this entrée delivering a range of distinctive flavours. The salty, sweet scallops are combined with silken smooth cauliflower puree, then enriched with an earthiness from the black pudding. With the slight bight of acidity from the Granny Smith apples, we hope you’ll agree this entrée is worth braving the cold for. This main is a new creation from the team at Manly. Taking advantage of our wood roasting oven, the trout is cooked in a paper bag along with the fennel and almond butter to give the fish a rich, smoky flavour. 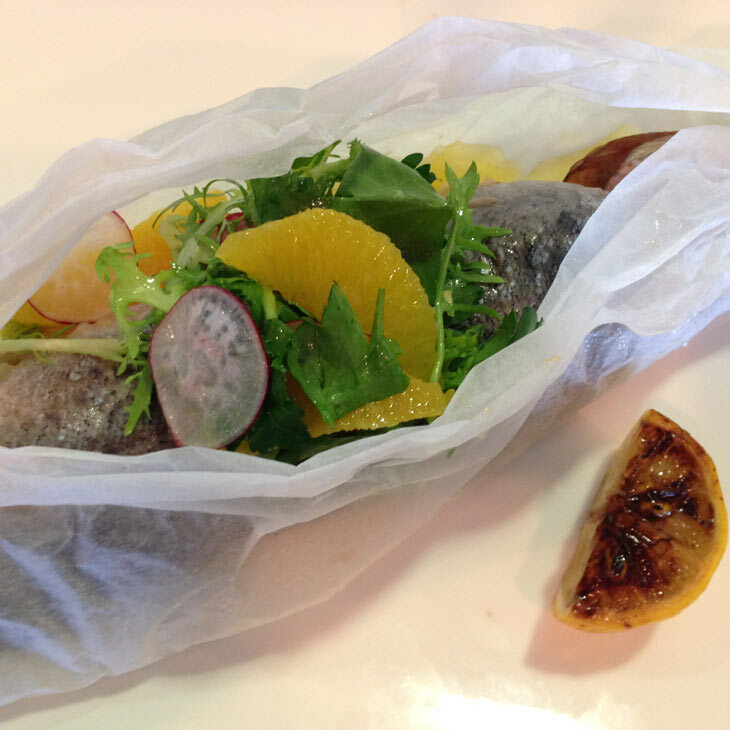 Orange and lemon segments in the herb, citrus and radish salad cuts through and complements the wood roasting. 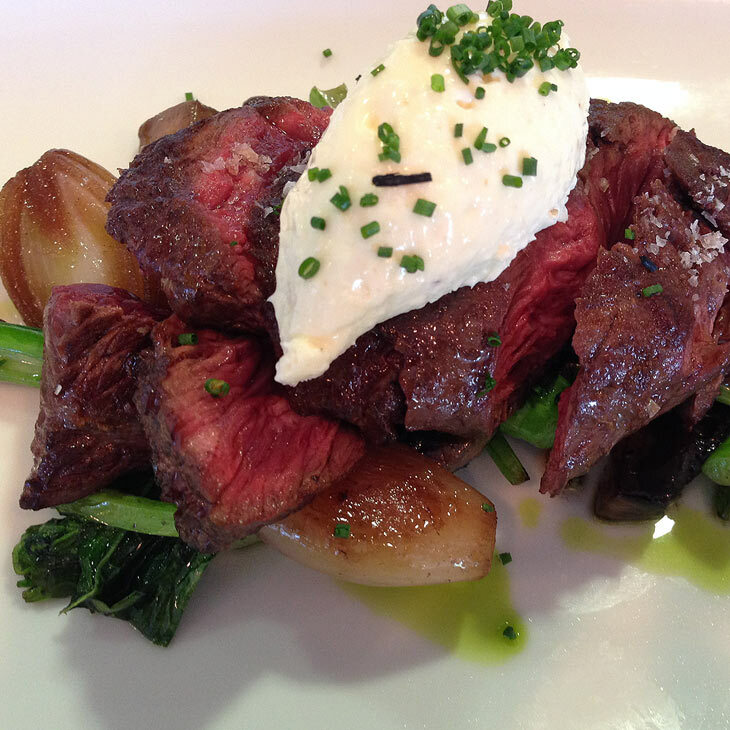 Another first for Manly, this meat dish uses a rarer secondary cut known as the ‘hanger’ cut. It’s big on flavour and cooked to your taste, with a simple complementary garnish of rapa, eschallots, mushrooms and horseradish cream. It’s back. With an oozy, gooey dark chocolate centre paired with hazelnut flavours in the macaroons and frangelico, this dessert is indulgence at its best. It’s a winter favourite, so be sure to let your family and friends know this one is back on the dessert menu. If you’re in the mood for a classic winter dessert, our spiced apple tarte tatin won’t disappoint. Warm, roasted apple combined with puff pastry, cinnamon and sugary caramel sauce creates a dessert that is both sweet and comforting. A classic Italian dish, vitello tonnato refers to cold slices of veal. Our Garfish chefs use finely diced blue fin tuna to create the mayonnaise and pickled white anchovies to give this dish our own unique seafood flavour, creating a modern take on this classic cuisine. 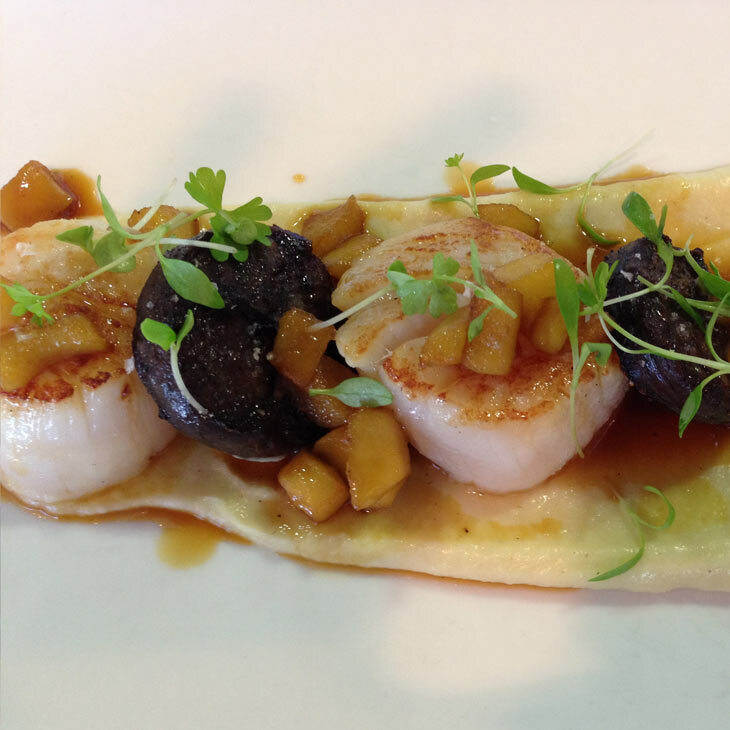 In this entrée, the grilled scallops are complemented by the smooth perfume of the parsnip puree. A selection of forest mushrooms including pine, oyster, and shitake, are combined with morcilla crumbs, a type of Spanish sausage. This gives the dish a hearty kick, making it a perfect start to any winter meal. This fragrant, rich and warming dish is a winter main for seafood lovers. We hand make the chilli and lemongrass chutney and then incorporate coconut milk to provide a depth of flavour that moves from smooth and sweet, to fresh and warming. This meat dish incorporates long, slow cooking techniques sure to sate any meat lover. Served with white beans and mushrooms, a green herb sauce called salsa verde is added to cut through the flavours of the beef and beans, while complementing their depth of flavour. This slightly aromatic steamed pudding combines citrus lemon flavours and passionfruit to add a sweet note of lightness to what is both a refreshing and warming pudding. Not to be missed this winter is our cherry sorbet accompaniment to our much loved Belgian waffles. Crisp chocolate, chantilly cream and kirsch syrup complement the cherry sorbet and waffles in what becomes a European style, sweetly spiced, warming winter dessert. This entrée is a rich, warming winter soup incorporating mussels from Port Lincoln, South Australia. It’s a great starter for a winter meal at Garfish ideal for providing some comforting respite from the cold. An Asian style scallop dish, the beef dumplings are wrapped in rice paper and complemented by a complex, fragrant Asian broth. It’s an entrée that promises flavour and warmth, well suited to the cooler weather. Back by popular demand, Kirribilli’s seafood laksa incorporates a variety of fish from our blackboard of the day. Garfish’s interpretation of this spicy noodle soup is sure to both warm and satisfy. 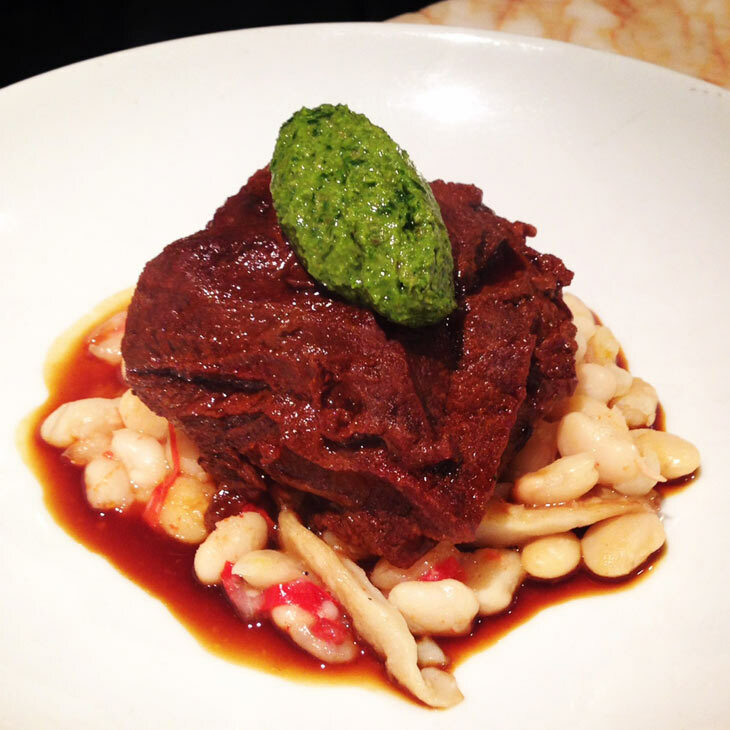 Winter paradise for meat lovers, our braised angus beef brisket is fall apart tender. Lightly smoked cauliflower puree, leaves of cavolo nero and a gremolata of parsley, lemon and garlic accompany this beautifully prepared meat dish. By far our most popular dessert, after one taste of Kirribilli’s sticky date pudding you’ll see why. Our warming sticky date pudding, combined with rich butterscotch sauce and cooling vanilla ice cream, is comfort food at its best, and you simply can’t go past this sweet finish to your meal. We look forward to sharing our range of winter dishes with you. Our Winter menu is available now at Manly, Kirribilli and Crows Nest.